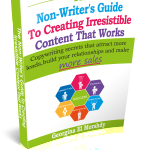 Thanks for requesting a copy of my free eBook – The Non-Writer’s Guide To Creating Irresistible Content That Works. Here’s the link so you can start using it now – just CLICK HERE. As an ambitious business owner you already appreciate the difference that well crafted copy can make to the success of your business. However, perhaps you’ve been intimidated by the blank page, struggled to know what to write or left ideas on the table because the right words refused to flow. If so, this Non-Writer’s Guide is for you :-). The five golden rules of irresistible content creation. How the right words will help you cut through the clutter and get noticed by the right people. 12 practical examples that show copywriting theory in practice. And as a special bonus I’ve also included my Copywriting Cheat Sheet – a simple checklist to help you determine if your content includes all the elements needed to make it successful. So you see, this guide isn’t only packed with theory – it also puts theory into practice to help you differentiate the good from the bad and the ugly. So make sure you download the guide right now and start putting the information it contains to good use. I hope you find the guide useful. I’ll be in touch again soon – unless I hear from you first!